The New York State English Language Arts (ELA) exams take place in less than one month. As they have been for many years, the tests are a source of great controversy amongst educators, administrators and parents. During a meeting at the New York State Education Department (NYSED) last month, State Education Commissioner, MaryEllen Elia, confirmed that despite having 4 years to address concerns of stakeholders about the validity of the state tests and the age appropriateness of the curriculum associated with those exams, the state may require additional time before returning to an arrangement where results on the tests count both towards a student’s academic record and a teacher’s annual evaluation. Following the direction of a special task force formed by Governor Cuomo, the State Education Department placed a moratorium on the use of state exams until July of 2019. In May of 2016, New York Supreme Court Judge, Roger McDonough, ruled that the teacher evaluation system based on state tests used to render a score for Great Neck elementary school teacher Sheri Lederman was, “capricious,” and “arbitrary.” Mrs. Lederman’s score was invalidated and stricken from her teaching record. Because the Lederman decision came during the time period in which the state had a moratorium in the use of its evaluation system, the judge was only able to rule on Mrs. Lederman’s score alone and not find the system in its entirety to be inequitable and illegal. However, should the state decide to reintroduce its flawed evaluation methods in the future, it will almost certainly be faced with an uphill legal battle as a result of the precedent established in the Lederman case. In response to these matters and many other concerns, parents across the state are continuing, in great numbers, to exercise their rights to opt out their children from taking state ELA and Math tests. On Long Island last spring, well over 50% of students scheduled to take the tests were opted out of doing so by their parents. There is no evidence to suggest that there will be any decrease in those numbers in 2018. Regardless of the high opt-out rates, the uncertainty amongst its own leadership that it can address educational and logistical concerns, and the almost certain uphill legal battle facing it should it reinstate past teacher evaluation practices, the state education department still seems determined to push on with its testing system. While doing so, the state also seems to be willing to condone the dissemination of questionable information in an effort to persuade districts to curtail opt-out numbers. The federal Every Student Succeeds Act of 2015 (ESSA) required individual states to produce their own accountability measures for student performance. New York State’s federally approved measures include calculating a school’s proficiency rate on state tests. The proficiency rate on state tests is calculated in two ways. One way includes an arbitrary score of 1 out of 5 for students who opt-out of the test. The second way calculates a school proficiency score based only on the students who actually take the tests. The State Board of Regents has assured the public that only the higher of these two calculations will be used for state accountability purposes, so that no school will be identified as low-performing simply because of its high opt out rate, and no students will be judged as failing because they refused to take the state exams. Nevertheless, some districts have advised parents that high opt out rates will result in their district receiving punitive measures such as a lower school ranking, reduction in state funding or a mandate by the state education department to formulate a plan for reducing opt outs. Nothing could be further from the truth and the state education department has been noticeably absent in making sure parents in these districts understand the facts regarding this issue. Lisa Rudley, a founding member of the New York State Allies for Public Education (NYSAPE), made the following comment about this matter in a NYSAPE press release. 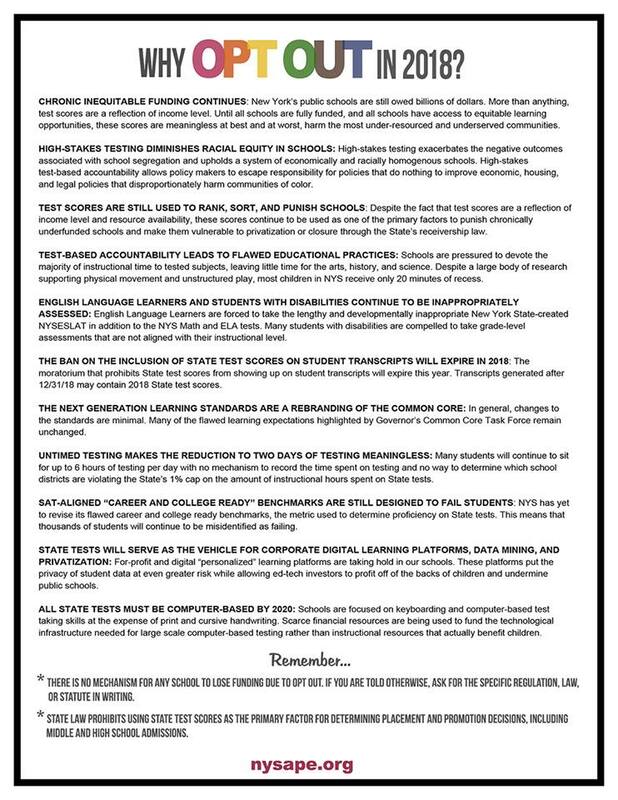 Founding member of Long Island Opt Out, Jeanette Deutermann, has assured her parent, teacher and administrator supporters that little harm whatsoever will come from parents choosing to opt out their children from state tests. While the State Education Department is uncertain as to the direction they are taking to address issues with their testing system, parents across the state are resolute in their determination to remove their children from having any part in it. From all accounts, the opt out movement in New York is likely to have as much strength as ever in 2018.